And.Id is an artist whose musical talents are impressively far-reaching, as his recent installment of the Back to Back series with Jazz interpretations of mobilee classics powerfully brought to everyone's attention. After a long spell in the studio with his B.A.N.D and a variety of instruments, And.Id has gone solo for his next project, "I Will Be There", and he's taking us back to the dance floor where he is equally at home, as his other releases on mobilee such as "First Talk" have shown. 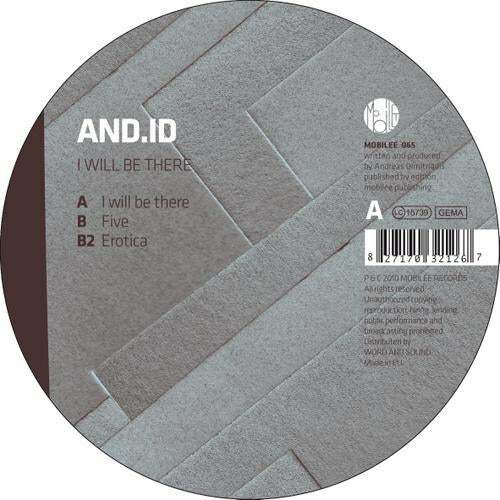 Title track "I Will Be There" lands heavily with a punching kick drum and there is little release before the bass and groove come in, meanwhile B1 Five brings back And.Id's signature jazzy sounds with some melodic piano chords. B2 "Erotica" brings all of the elements together with a strong melodic bass line and punch kick, making it the stand out track of the release. Tthere is something for everybody in this package and it will definitely get you moving....enjoy!